To date, 6 tick-borne rickettsiae pathogenic for humans are known to occur in Africa and 4 of them were first identified in ticks before being recognized as human pathogens. We examined 33 and 5 Amblyomma tholloni ticks from African elephants in the Central African Republic and Gabon, respectively, by PCR amplification and sequencing of a part of gltA and ompA genes of the genus Rickettsia. The partial sequences of gltA and ompA genes detected in tick in Gabon had 99.1% similarity with those of R. heilongjiangensis and 97.1% with those of Rickettsia sp. HL-93 strain, respectively. The partial gltA and ompA gene sequences detected in tick in the Central African Republic were 98.9% and 95.1% similar to those of Rickettsia sp. DnS14 strain and R. massiliae, respectively. 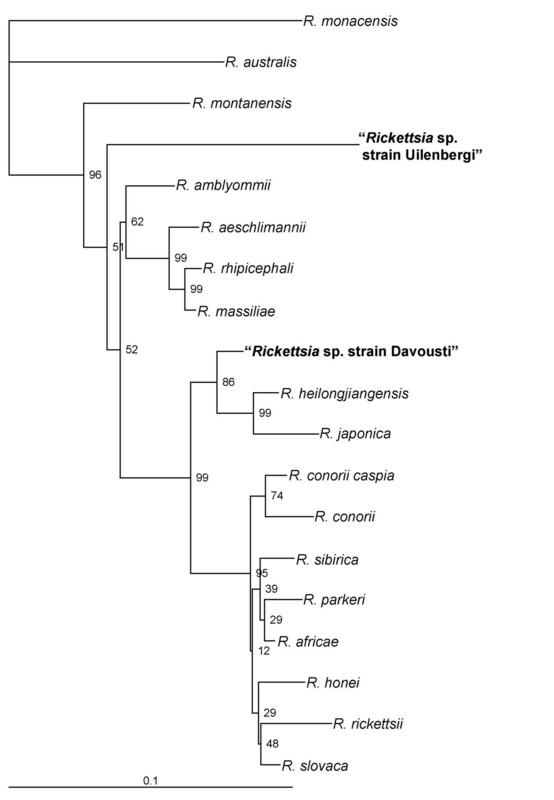 Phylogenetic analysis showed Rickettsia sp. detected in Gabon clusters with R. japonica and R. heilongjiangensis in a phylogenetic tree based on the partial gltA and ompA genes. The genotype of the Rickettsia sp. detected in the Central African Republic is close to those of R. massiliae group in the phylogenetic tree based on partial gltA gene sequences, and distantly related to other rickettsiae in the tree based on partial ompA gene. The degrees of similarity of partial gltA and ompA genes with recognized species indicate the rickettsiae detected in this study may be new species although we could only study the partial sequences of 2 genes regarding the amount of DNA that was available. We propose the Rickettsia sp. detected in Gabon be provisionally named "Rickettsia sp. stain Davousti" and Rickettsia sp. detected in the Central African Republic be named "Rickettsia sp. strain Uilenbergi". Spotted fever group (SFG) rickettsiae are obligatory intracellular Gram-negative bacteria that belong to the genus Rickettsia. They are associated with arthropods, mainly ticks, which act as vectors and/or reservoirs . Between 1984 and 2005, 11 new species or subspecies of rickettsiae have been identified as emerging agents of human tick-borne diseases . Additionally, many SFG rickettsiae have been identified only in ticks and their pathogenicity for humans is unknown . To date, 6 tick-borne rickettsiae pathogenic for humans are known to occur in Africa . Rickettsia conorii conorii, the agent of Mediterranean spotted fever, transmitted by Rhipicephalus sanguineus  is endemic in North Africa and has been reported from South Africa, Kenya and Zimbabwe. R. conorii caspia, the agent of Astrakhan fever, has recently been detected in Rh. sanguineus in Chad. It is now almost 15 years since Rickettsia africae, the agent of African tick-bite fever (ATBF), was discovered in sub-Saharan Africa. In southern Africa, Amblyomma hebraeum, a tick of large ruminants and wildlife species, is the recognized vector (and reservoir) of R. africae, which has also been detected in A. variegatum throughout west, central, and eastern sub-Saharan Africa, and in A. lepidum from the Sudan. Rickettsia aeschlimannii has been found in Hyalomma marginatum marginatum and H. marginatum rufipes and, while probably following the distribution of these ticks. This rickettsia has been identified in Morocco, Niger, Mali, Zimbabwe and South Africa. Rickettsia massiliae which was proven to be a human pathogen in 2005 has been detected in several Rhipicephalus ticks parasitizing cattle in the Central African Republic and Mali . It should be noted that the four last rickettsiae were first identified in ticks before being recognized as human pathogens . Finally, R. rhipicephali, a rickettsia of unknown pathogenicity, has been detected in ticks of the Rh. compositus group and Rh. lunulatus . Here, we report two candidate new species in the genus Rickettsia detected in ticks collected from African elephants. Thirty-eight ticks were collected from African elephants in the Central African Republic (5; 1 female, 3 males and 1 nymph) and Gabon (15 females and 18 males). They were all identified as Amblyomma tholloni. One female from the Central African Republic and 1 male from Gabon were PCR positive for the rickettsial gltA and ompA genes. These amplicons were sequenced and ambiguous parts in the end of each sequence were deleted. Consequently, 914 bp of gltA and 590 bp of ompA genes, and 1196 bp of gltA and 544 bp of ompA genes were obtained from tick samples from Gabon and the Central African Republic, respectively. The partial sequences of the gltA and ompA genes of Gabon tick sample were 99.1% identical to those of R. heilongjiangensis [GenBank accession number, AY280709] and 97.1% to those of Rickettsia sp. HL-93 strain [AF179364], respectively. The partial sequences of the gltA and ompA genes amplified from the tick from the Central African Republic were 98.9% identical to those of Rickettsia sp. DnS14 strain [AF120028] and 95.1% identical to those of R. massiliae [U43799], respectively. Phylogenetic trees based on the partial sequences of gltA and ompA genes are shown in Figures 1 and 2, respectively. Phylogenetic tree based on gltA gene partial sequences. The GenBank accession numbers used to construct the phylogenetic tree were as follows: R. parkeri, U59732; R. sibirica, U59734; R. sibirica mongolotimonae, U59731; R. africae, U59733; R. conorii, U59730; R. rickettsii, U59729; R. honei, U59726; R. slovaca, U59725; R. japonica, U59724; R. montanensis, U74756; R. massiliae, U59719; R. rhipicephali, U59721; R. aeschlimannii, U59722; R. helvetica, U59723; R. australis, U59718; R. akari, U59717; R. typhi, U59714; R. canadensis, U59713; R. prowazekii, U59715; R. amblyommii, AY375163; R. heilongjiangensis, AY280709. Phylogenetic tree based on ompA gene partial sequences. The GenBank accession numbers used to construct the phylogenetic tree were as follows: R. australis, AF149108; R. heilongjiangensis, AF179362; R. honei, U43809; R. slovaca, U43808; R. sibirica, U43807; R. rickettsii, U43804; R. rhipicephali, U43803; R. parkeri, U43802; R. montanensis, U43801; R. aeschlimannii, U43800; R. massiliae, U43799; R. japonica, U43795; R. conorii, U43806; R. africae, U43790; R. amblyommii, AY062007; R. monacensis, AF201329; and R. conorii caspia, AY112668. To the best of our knowledge, this work provides the first molecular detection of spotted fever group rickettsiae in A. tholloni. This three-host tick is primarily found on African elephants [4, 5] but also occurs on other animals including reptiles (lizards), birds and mammals (horse, antelope, wild pig, mongoose, buffalo and hippopotamus). It has been reported to feed on humans [4, 5] and occurs widely in Africa following the distribution of the African elephant; from South Africa in the south to the Sudan in the north, and from Sierra Leone in the west to Somalia in the east [4, 5]. Amblyomma tholloni can transmit Ehrlichia ruminantium, the agent of heartwater in domestic ruminants, but the tick has not been implicated in field outbreaks of the disease . The rickettsiae we detected in A. tholloni in our study are members of the spotted fever group of rickettsiae. All the gene sequences that we have identified were unique. The rickettsia from Gabon clustered with R. japonica and R. heilongjiangensis in the phylogenetic trees based on the partial gltA and ompA genes (Figure 1 and 2). The rickettsia from the Central African Republic was close to the R. massiliae group in the phylogenetic tree based on the partial gltA gene sequences (Figure 1) and distinct from other rickettsiae in the tree based on the partial ompA gene (Figure 2). Recently, guidelines for the genotypic classification of rickettsiae at the genus, group, and species levels have been published . According to these criteria, the degrees of nucleotide similarity with recognized species indicate the rickettsiae from the A. tholloni may be new species. However, we could only study the partial sequences of 2 genes regarding the amount of DNA that was available. 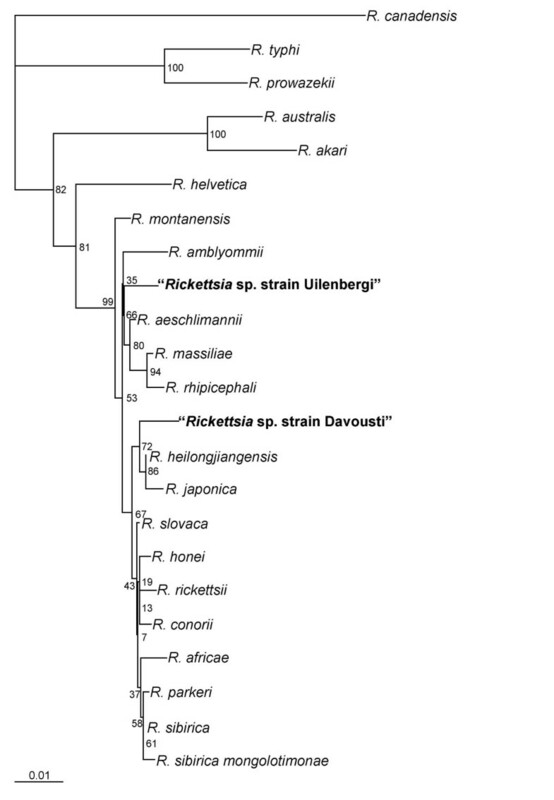 Until isolates are made and definitively characterized as new species, we propose the rickettsia in the A. tholloni from Gabon be provisionally named "Rickettsia sp. strain Davousti" after the French veterinary scientist Bernard Davoust in recognition of his work on zoonoses. Further, we propose the rickettsia in the A. tholloni from the Central African Republic be provisionally named "Rickettsia sp. strain Uilenbergi" after the Dutch veterinary scientist Gerrit Uilenberg in recognition of his research into tick-borne tropical diseases. Both scientists coordinated field works that help to get the ticks used in our study. The ticks harboring "Rickettsia sp. strain Davousti" and "Rickettsia sp. strain Uilenbergi" were feeding on elephants when they have been collected. It is not clear if the ticks were infected with the rickettsiae or if the organisms were only present in the ingested elephant blood. It appears unlikely the elephants were rickettsemic, however, as other ticks feeding on the same animals did not contain rickettsiae. It seems most probable that the organisms are associated with the ticks as it is commonly the case with other spotted fever group rickettsiae . The tick vectors of the spotted fever group rickettsiae transmit the organisms while feeding and the role that the African elephant, the major host of A. tholloni, plays in the biology of the new rickettsiae requires further investigation. The pathogenicity of "Rickettsia sp. strain Davousti" and "Rickettsia sp. strain Uilenbergi" in the other species on which A. tholloni feeds, should also be investigate. In particular, A. tholloni is known to feed on people [4, 5] and it would seem prudent to consider "Rickettsia sp. strain Davousti" and "Rickettsia sp. strain Uilenbergi" as potential human pathogens until further studies clarify the situation. The rickettsiae detected in A. tholloni in our study are members of the SFG rickettsiae, and their gltA and ompA gene sequences were unique. The degrees of similarity of partial gltA and ompA genes with recognized species indicate the rickettsiae detected in this study are new species. Although the pathogenicity of these rickettsiae were not evaluated in our study, it would seem prudent to consider these rickettsiae as potential human pathogens until further studies clarify the situation because A. tholloni is known to feed on people. Ticks were collected from African elephants (Loxodonta africana) in the Central African Republic in 1970 and in Gabon in 2004. In Gabon, ticks were collected from an elephant which had just been killed illegally by hunters. The ticks were identified on their morphology [4, 5] and kept in 70% ethanol until DNA was extracted in Marseille, France, in 2005. Products amplified using PCR for rickettsial gltA and ompA were sequenced as described previously [9, 12], used in a BLAST search  and aligned with sequences of other rickettsial species registered in GenBank using Clustal program . Sequences of partial gltA gene were extended using primers CS2d and CS535R, and CS409d and CS1273r as described previously [9, 14]. Phylogenetic trees were constructed using TreeView  based on the data from ClustalW. The partial gltA and ompA sequences of rickettsia in tick from Gabon have been deposited under accession number DQ402516 and DQ402517, respectively. The partial gltA and ompA sequences of rickettsia in tick from Central African Republic have been deposited under accession number DQ402514 and DQ402515, respectively. We are grateful to O. Bourry and J. Wickings from the Centre International de Recherches Médicales de Franceville, Franceville, and to F. Maisels from the Wildlife Conservation Society, Libreville, Gabon. We thank Prof P. Kelly for editing the paper. KM participated in PCR amplification and sequencing. PP identified tick species and coordinated the study. JMR participated in the analysis of sequences. KJ collected ticks in Gabon and the Central African Republic. DR designed the study. KM, PP, JMR and DR drafted the manuscript. All authors read and approved the final manuscript.